I’m going to show you how you can build your email list more quickly, more efficiently and with less time than ever before. Grab your sneakers, because this is going to go quickly. I bet someone you know could use this right? This is something I’ve been mapping out for a few weeks, but only implemented it last week. There’s a few things you’re going to need, so make sure you have them in place. A Facebook ad account. It’s not absolutely necessary but building a business takes money. We’re talking $10-$20 per week for this plan. An email system. I really like Active Campaign. If you absolutely can’t afford $9 a month, go with Mailchimp. Something along the lines of Pop Up Ally or Thrive Leads. I actually use both and the cost was well under $200. If you have to choose, go with Thrive for this plan. A business Facebook page. NOT your personal profile. When you write your blog post, I want you to think of a little something that you can give it away. I call them content upgrades, but you can call them whatever you want. The point is, something that you can whip up in about 5 minutes each week to give away. It absolutely must be related to the blog post and it absolutely must be free and it absolutely must not take you a long time to create it. Once you have your post ready for the week, I want you to use your graphics program to create a stellar image. Because we’re tying in with Facebook ads, it’s really important that the text that you use on this image does not cover more than 20% of the image or your ad will get denied. Here’s a handy tool to check if your image is FB ready. 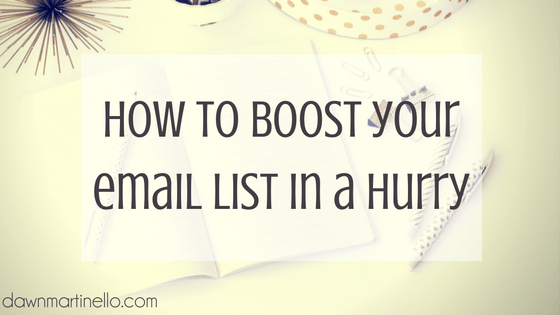 Next you’ll want to set up your automation for when people subscribe to your list to get their content upgrade. In my Active Campaign account, that means creating a new form and a new automation that will deliver the email. Since I now have a system around these content upgrades, I simply copy what’s already there, change the titles and edit the emails. Head into your opt in system (Thrive, Pop Up Ally, etc). You’re going to want a 2 step opt in. You’ll see one here in this post. It’s a graphic that I pop into my blog post and when it’s clicked, an opt in pops up so that you can sign up to get your content upgrade. While I’m in my opt in system, I also update my top of page opt in. This is something that changes every week so it’s only a matter of changing the text on the opt ins and swapping out the form code that it belongs to. Now, you’re going to go to your Facebook business page and create a status update. I like to link to my blog post so it pulls up my blog image and an excerpt. Then I create a catchy bit of copywriting at the top. Last weeks blog post was on how network marketers can be uber successful so the copy on my update read: Do you know what the #1 mistake that Direct Sellers and Network Marketers are making in their business? Click over to this blog post where I talk about the 4 possibilities that can destroy ANY direct selling business. Once you have that posted, I want you to like the post and add a comment below it. Both of these things will help to boost the reach of the post. Now, click on “boost post” to create an ad out of that post. You’ll want to assign your targeting and your budget. Note that it can take Facebook up to 24 hours (or sometimes longer) to approve the ad. To avoid losing time, try scheduling your ad. First, create and schedule your Facebook post. Then, create and schedule your boosted post. I’d give yourself at least 2-3 business days – this gives Facebook enough time to review and approve your ad and you have some buffer time if anything happens. Create a status update on your Facebook page. If you decide to implement this, let me know how it goes: did you find that more people were opting into your list? How did your Boosted Post perform?